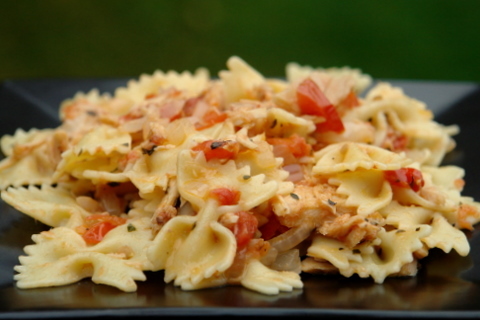 This recipe for tuna and tomato pasta is a perfect last minute meal. 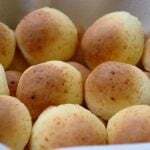 It’s easy and quick and uses pantry items. 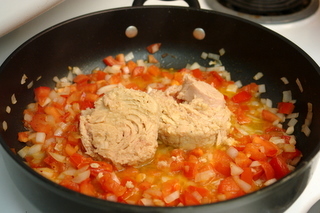 The sauce is made with canned tuna fish, tomatoes, onions, olive oil, and oregano/basil. I usually use fresh tomatoes for this pasta dish, but you can also use a cannned diced tomatoes instead if you don’t have fresh ones. You can use dried herbs, but if you have fresh basil I would recommend adding some at the end for a touch of fresh flavor, you can also top it with grated parmesan cheese and a drizzle of olive oil. 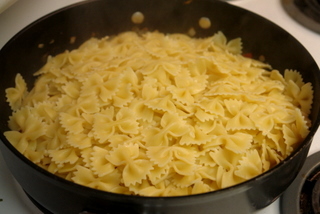 You can made this with any type of pastas, my favorites are elbows (farfalle), macaroni, rigatoni, and spaghetti. If I have more time or want to change it up, I add some fresh crushed garlic, and for an Ecuadorian twist some ground achiote (annatto) and ground cumin. You can also add diced bell peppers, and if you like it spicy then add a bit of fresh chopped hot peppers, chipotle paste, or a little bit of ground chili powder or chili flakes. 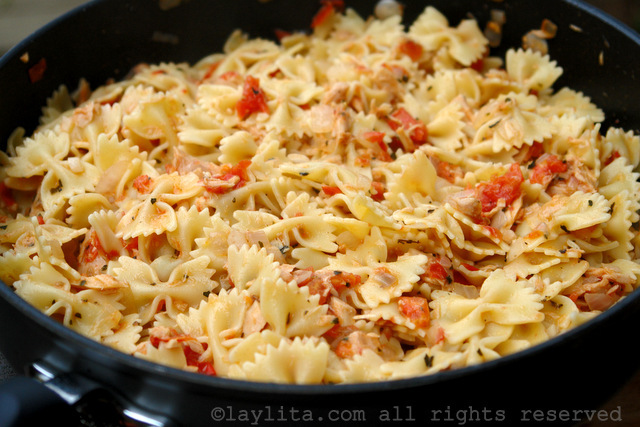 Recipe for quick and easy tuna and tomato pasta, the sauce is made with canned tuna fish, tomatoes, onions, olive oil, and herbs. 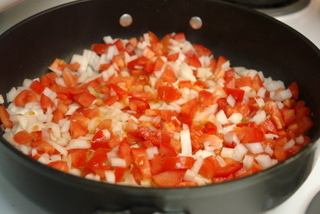 Add the onions and tomatoes, cook on medium heat for about 8-10 minutes or until soft. 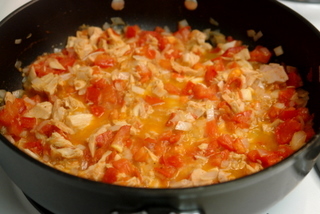 Add the tuna fish, mix well and cook for another 5 minutes. Add the oregano/basil. Stir in the cooked pastas and serve with additional fresh basil, grated parmesan and a drizzle of olive oil. 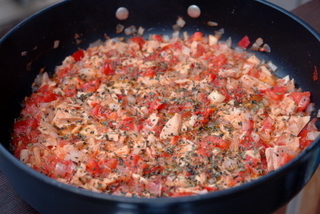 For an Ecuadorian twist add some ground achiote (annatto) and ground cumin when cooking the onions and tomatoes. You can also add diced bell peppers, and if you like it spicy then add a bit of fresh chopped hot peppers, chipotle paste, or a little bit of cayenne pepper. For a creamy variation, add some heavy cream or some Mexican style crema. Back in my college days, I had a classmate from Italy. 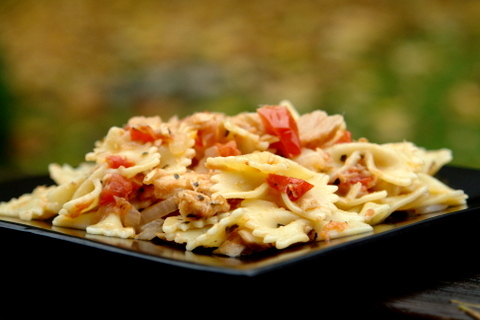 One day while working on a group project late at night, she made this quick dish of pasta with a tuna and tomato sauce. 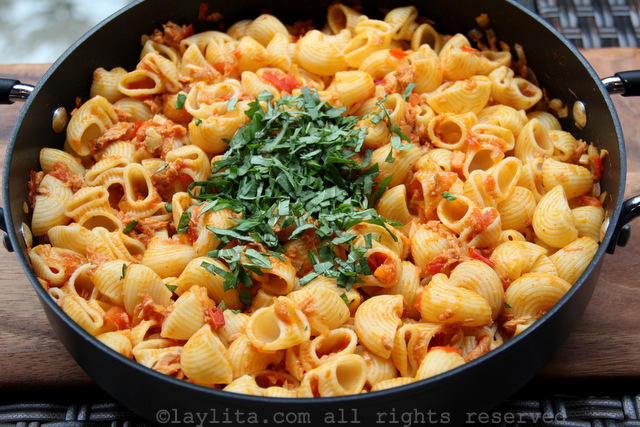 It reminded me a lot of the quick pasta dishes I used to make for my friends in high school. 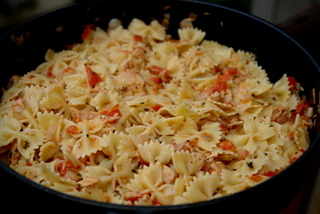 I make this tuna and tomato pasta dish on those days that I need to cook something that is easy, fast and that the whole family will eat or when I almost out of groceries. I am a little bit picky about the type of canned tuna I use. This is partly because I grew up in a country that has very good quality canned tuna. I prefer the kind that is packed in olive oil (instead of water), and it seems almost impossible to find canned tuna packed in olive oil at the regular grocery stores. Fortunately I find it at Trader Joe’s (I love that store), you can also find it a Whole Foods or other specialty stores, but the price is higher. I made this last Friday and it came out delicious! 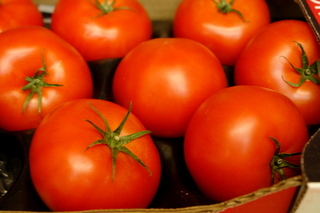 It’s real important to use good quality tuna packed in olive oil or vegetable oil. I minced 2 cloves of garlic and added a pinch of red pepper flakes to the olive oil before sauteeing the onions and tomatoes. 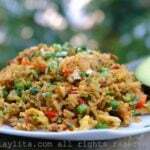 Great recipe Laylita! Hey do you know you can do this with yellow rice but just add cumin to the tuna while frying, it is delicious, my mom is from ecuador and she taught me this. Oh my goodness. I think I am in love with this site.. I am on frugal eating, and a can of tuna, a can of tomatoes, a bag of dried Italian herbs,a hunk of paremesan, and a bunch of fresh parsley was all that I had, and I made an amazing meal. Just a couple of points. I used a can of tuna in water. Dont put the water in. And add some grated paremesan at the very end. FInally it tasted great with some fresh parsely. Saved me 20 euros in a nice restaurant here in Paris. I will be using this in the future! I used whole wheat farfalle as well. I found it to be even more delicious as a cold pasta. I did it today. my family loved it. It’s easy, tasty and good ! That looks so elegant for canned tuna! I’ll have to try it, our family loves pasta with light sauces. 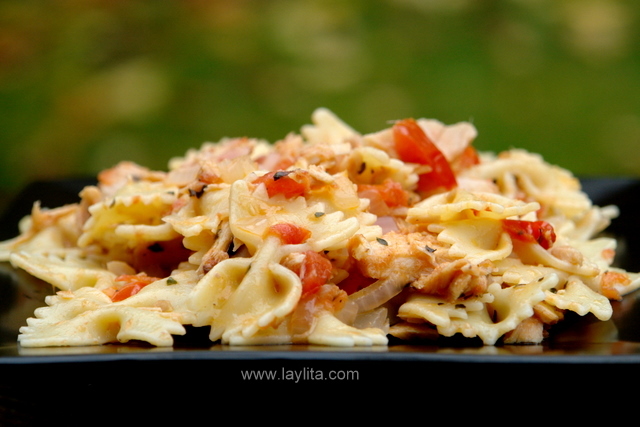 thats a super quick pasta to make..yumm!! 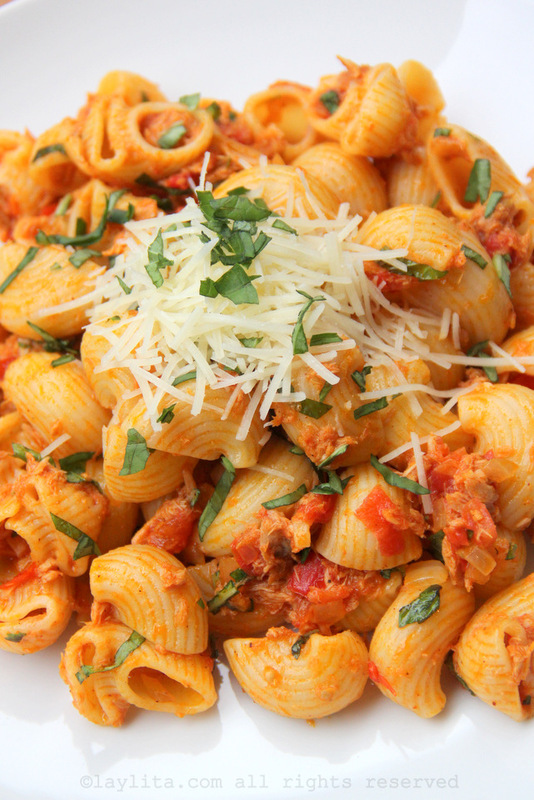 I love those quick, delish pastas. Thanks! yep, ditto on the crushed red pepper flakes and garlic. i add them in the pan first, then onion, then tomatoes. arugula goes wonderfully too! 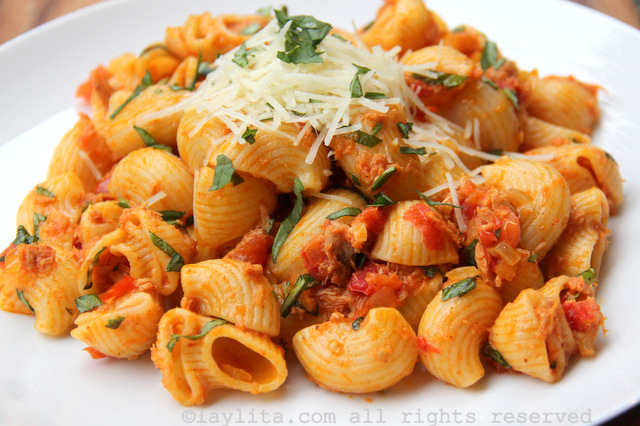 this is one of my favorite pasta dishes– so good! 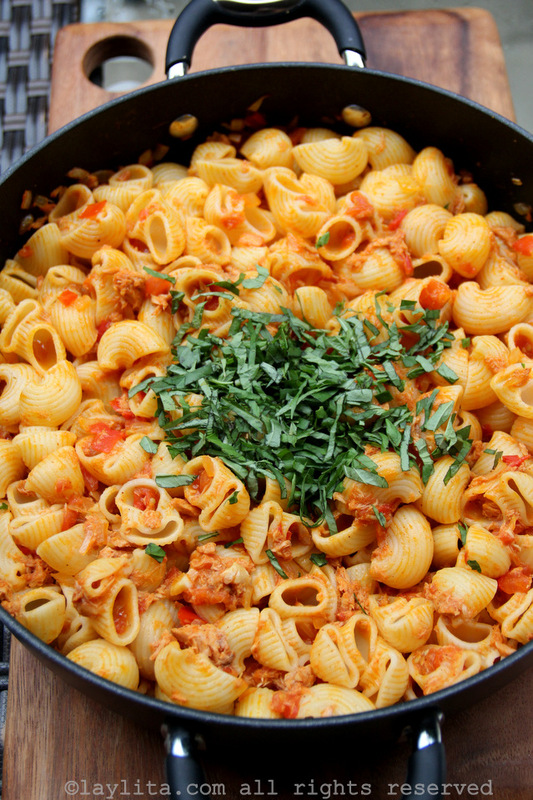 A delicious pasta dish! yummy! This is even better if you add hot red pepper flakes at the end, or a couple cloves of fresh minced garlic with the onion, or both! Red wine in the sauce is yummy as well.